This chicken cacciatore is cooked in the slow cooker. Boneless chicken breasts, sliced mushrooms, and garlic make this dish a wonderful, rustic combination. 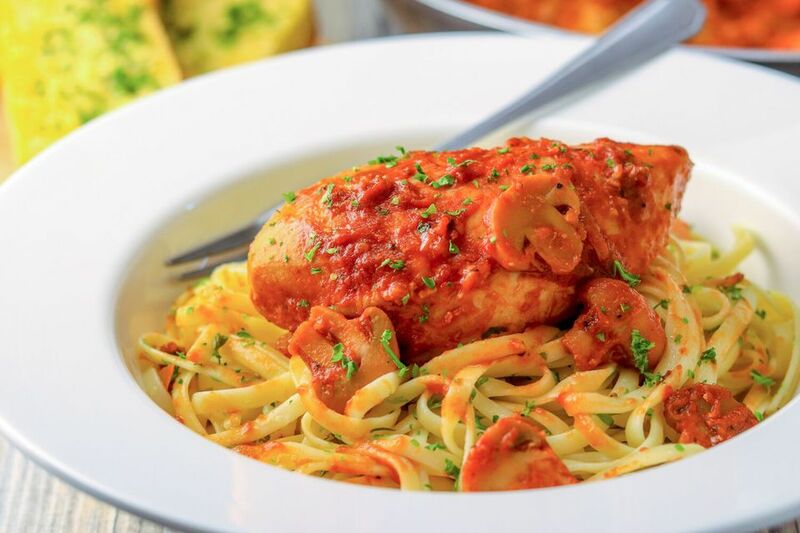 Serve this chicken and tomato sauce over hot cooked spaghetti or another similar pasta. Boneless chicken thighs are an excellent choice for this recipe because they are more flavorful and stay moist and juicy in the slow cooker. A combination of chicken breasts and chicken thighs would be excellent as well. Cooked on low, the condensation should add extra moisture to the dish, but if you cook the dish on high setting or if your slow cooker tends to cook quickly, check and add more chicken stock or water, as needed. The oregano and basil are added about halfway through the cooking to prevent bitterness. If the sauce is somewhat bitter, add a teaspoon or more of granulated or brown sugar, or to taste. Feel free to leave the wine out and use more water or stock. Put the sliced onion in bottom of the slow cooker. Top with the chicken breasts or thighs. In a bowl, combine the tomato paste, mushrooms, salt, pepper, garlic, bay leaf, wine, and water or stock; stir to blend thoroughly. Spread the sauce mixture over the chicken. Cover and cook on low 5 to 7 hours, or about 3 hours on high. About halfway through the cooking time, add the oregano and basil. Taste the sauce and adjust seasonings. Serve as a sauce for hot cooked spaghetti or similar pasta. Add 1/2 teaspoon of crushed red pepper flakes to the sauce mixture.